Asian Longhorned Beetle (ALB) (Anoplophora glabripennis) is potentially the most devastating non-native pest to have ever arrived in North America. The beetle kills trees belonging to 12 genera in 9 plant families. This includes all native maples, a preferred host. Successful eradication is essential to avoiding a catastrophic loss of trees on a scale never before seen in the U.S. 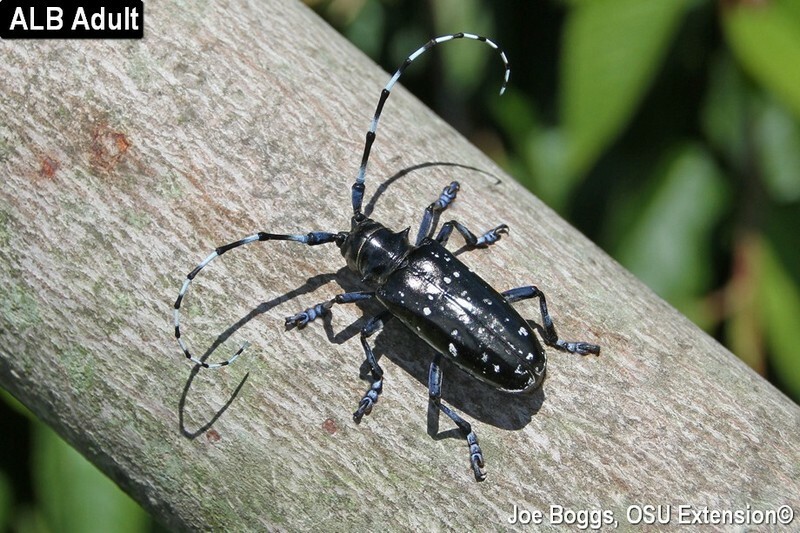 The Ohio Department of Agriculture (ODA) in collaboration with the USDA, Animal and Plant Health Inspection Service (APHIS) announced yesterday that Batavia and Stonelick Townships in Clermont County, Ohio, are now free from Asian longhorned beetle (ALB). It's a significant "win" for the earnest professionals dedicated to protecting us from this pernicious pest. It's also the first ALB infestation to be eradicated in Ohio. The eradication announcement was made by ODA Director David Daniels during a small ceremony in Batavia. The event was commemorated with the planting of a Yellowwood (Cladrastis kentukea); a native species that's not on the ALB menu. Jeffery and Jill Connor were recognized through a proclamation and certificate of appreciation by the ODA and the USDA APHIS for their significant role in the success of the eradication effort. The Connors acquired wood from a dying maple taken down in Bethel (Tate Township) located about 12 miles from their property. This was before ALB was discovered in that village in 2011. At the time, no one knew ALB had found its way into Ohio so there was no reason to suspect the wood harbored the beetle. Thus far, every ALB infestation in North America originated directly from Asia and so-called satellite infestations have occurred when infested material has been unwittingly moved before the original infestation is discovered. ALB has been eradicated elsewhere and I believe it will be eradicated in Ohio. However, eradication takes time. It's a slow, methodical process because the cost of failure is so high. This is why we stress the value of early detection. Finding the beetle early means that less time (and money) are required for eradication. In 2012, Jeffery found a broken branch from one of his live and apparently healthy maples laying near their firewood pile. Unusually heavy branch breakage on a live maple is a symptom of ALB because the larvae tunnel through the xylem weakening the structural integrity of the wood. Upon a close examination, he found another ALB symptom: perfectly round adult emergence holes. A #2 pencil may be inserted deep into the exit holes indicating they extend into the xylem. The Connors acted quickly in contacting the ODA which set into motion the successful eradication effort that was honored in yesterday's ceremony. I have long used the Connor's sharp detective work and quick actions as a "case study" in my ALB teaching presentations to demonstrate exactly what people should do to help us win the beetle battle. Through no fault of their own, they were caught-up in the ALB saga; however, they stepped-up to play a pivotal role in helping us avoid a catastrophic outcome. We owe them our gratitude. In my opinion, there are also other unsung heroes in the ALB saga. These are the dedicated individuals who work for our ODA and the USDA APHIS. These trained professionals strive to keep non-native pests and diseases of both plants and animals at bay. Their work is critical to our well-being, but they never brag about their successes. That's why yesterday's ceremony was so important; there were smiles all around. Of course, afterwards, they all went back to quietly doing their essential work; on behalf of all of us. We owe them our support and gratitude. The ODA and USDA APHIS will move to lift the ALB quarantine of Stonelick and Batavia Townships which will reduce the regulated areas of Clermont County from 62 to 57 square miles. The original and larger ALB infestation in Tate Township as well as the satellite infestation in Monroe Township remain active targets for eradication. The bottom line: so far, so good!